You've got to see it to believe it! As the LED cork light changes colors, so does the air plant. 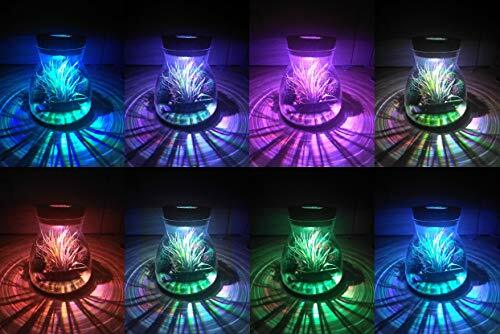 The light grows and fades into a cycle of 9 different colors, lighting up the air plant to give it a luminescent look of the color of the light. LED LIGHT DISPLAY - Features a cork light display with waterproof lights, push button for different colors - as the light changes colors, the air plant illuminates changing colors as well, you won't find this anywhere else, a must see! HOME DECOR - Displays great in the bedroom, bathroom, windowsill, living room, patio, office desk, or virtually anywhere you want to bring a little color and life to! CYS EXCEL Pack of 1 Plant Terrarium Glass Orbs Air Plants Tea Light Candle Holders Succulents Moss Miniature Garden Planters Home Décor-H-9" Body D - 8"